Kids Being Bad? Ground Them For Halloween This Year! Have your kids been little stinkers lately? Ground ’em for Halloween – that will teach them a lesson! Here’s a unique Halloween yard decoration that I’ve kept (unintentional) tabs on for the past couple of years. It’s displayed in a subdivision just down the street from ours and I have yet to have seen any other yard with anything quite like it. This photo was taken during the Halloween season in October 2004. Compare it to the updated photos shown below. 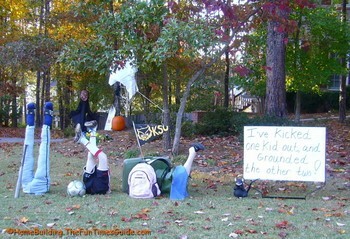 This is not only a Halloween yard decoration. It has a tinge of autobiography to it, as well as being just a bit on the morbid side. I guess you could do something like this in your own yard as a Halloween decoration and apply the same basic ideas of what your kids are up to in that particular stage in their life. It’s definitely unique and fun! I’ll let you look at the photos yourself and come to your own conclusions. Update: I’ve had numerous inquiries into how to stuff and stake these “grounded kids”. Fun Times Guide reader, Kelly D, saw it here and liked the idea so much she decided to try it in her own yard. She has it all figured out and I asked her if she would share how she went about stuffing her kids. She even got paid to stuff a couple of kids for someone that admired them and wanted the same thing. I’m sure there are different ways to go about doing this but Kelly did a great job and she even sent a photo over to me so I could share it with everybody! Measure the length of the pants you’re going to use from waistband to ankle, and add 6″ to that length, cut your PVC pipe in that length — 2 for each kid — and put a cap on one end of each “leg”. You will want to drill a hole in the middle of the cap so that it’s easier to put the screw through. Stuff the majority of the socks, place the end of the PVC pipe with the cap on it in the heel of the sock, screw through the bottom of the sock into the cap on the PVC pipe, then put the pants on him and safety pin them in place. Finish stuffing the ankles and legs, and safety pin around the waist to keep it closed. You’ll have the 6″ left sticking out of the waist to stick them in the ground. Use a hammer and position the legs however you want by lightly hammering on the bottom of the foot where the PVC pipes’ cap is. It actually works just fine to skip the screws completely! Just make sure to use the caps on the ends of your PVC pipe that goes in the socks so that you have something solid to hit with the hammer. Cover them with a garbage bag if it’s going to rain! They hold up great! Put a spot light on them if you want them to show up better at night.